Scraping the sides of the bowl, Abby Slater is forming a dough of milk, sugar, yeast and flour. It’s Slater’s first time making Easter bread. She’s observed and helped her Aleut family make it many times before though. The recipe her aunt uses is the same the family has been using for generations. Originally from Kashega, a small village near Dutch Harbor, Slater’s family traditionally used dried berries and candied fruits in their Easter bread. Diane Chris says that the Easter bread in Prince William Sound is elaborately decorated. She’s a Matushka — priest’s wife — at St. Innocent Russian Orthodox church in Anchorage. Easter bread, also known as kulich, is a decadent, egg-rich, dairy-rich, yeast-risen bread. Mother Capitolina, the only nun at St. Innocent Russian Orthodox church in Anchorage, says the bread symbolizes Easter. “We’re doing everything we have fasted from: butter, eggs. Now it’s the resurrection,” Mother Capitolina said. Chris helps make food for a bake sale the church is having. She says the bread is baked in coffee tins, representing the tomb Jesus resurrected from. Traditionally, Easter bread is always made by women and is a skill mothers pass down to daughters. Every year, St. Innocent church has an annual bake sale where church members bake Easter bread, fry bread, piroshkis, pirok and other traditional foods. The money from the sale goes to their church and is open to the public. It’s not just the Alaska Russian Orthodox population that enjoys the tradition of Easter Bread. Chris says that St. Innocent’s annual bake sale is always the Saturday before unorthodox Easter. 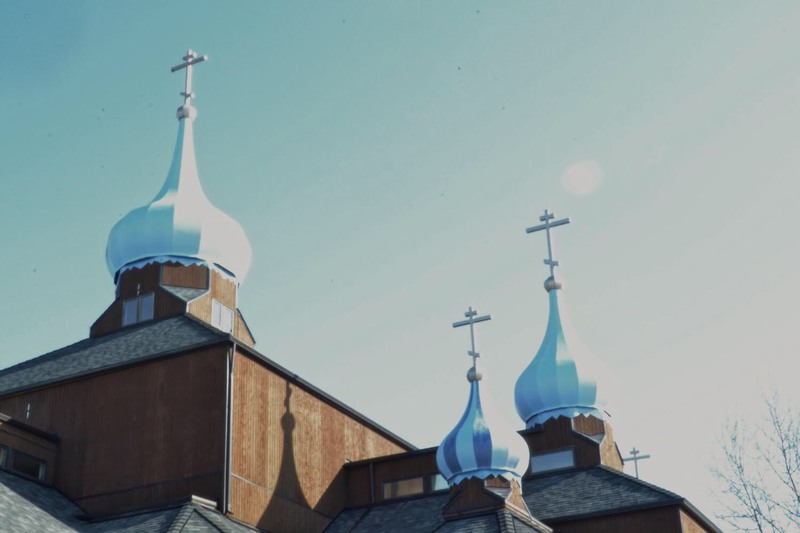 There are over 50,000 followers of Russian Orthodoxy in Alaska, and 49 parishes set up across the state. The first Russian Orthodox Church established in Alaska was on Kodiak Island in 1795. Many of these Russian Orthodox churches are baking Easter bread in mass quantities; some are even shipping it. St. Tikhon, another Russian Orthodox Church in Anchorage, also sells Easter bread. Via their Facebook page, St. Tikhon takes orders for Easter bread and sometimes ships to villages across Alaska. The bread is blessed on Easter Sunday by members of the Russian Orthodox church and then shared with the congregation. Easter bread is only eaten by the Russian Orthodox between Easter and Pentecost, which is 49 days after Easter. Slater isn’t Russian Orthodox, but the making of Easter bread ties her to her Alaska Native family.